I think the hardest thing to deal with as a new mom is making your schedule work with your baby’s needs. Our busy lifestyle requires us to run errands and it can be challenging to complete these in the time between naps and feedings. I personally think it’s good to get the baby out and about, but you don’t want to interrupt their precious sleep schedule. An ideal item to assist in this dilemma is the SnoozeShade, a blackout blind created by a British mother and designed to fit most prams and strollers. 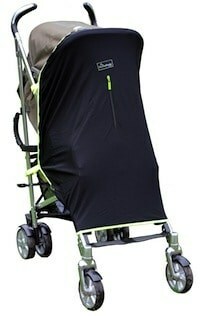 This blind blocks out bright lights and stimulus, allowing your baby to rest comfortably while you are on the go. I definitely find some baby items nearly impossible to use so I was pleased that this product delivered on it’s promise of being easy to use with any stroller you happen to have. The velcro fasteners are very simple to operate and attach easily to the stroller. It was clear and intuitive to figure out how to attach it without any elaborate instructions needed. The shade is made of breathable mesh and promises to block out 94% of light. It also offers UPF50+ sun protection. I especially like that it has a small zipper in the front that allows you to take a peek at your baby without removing the entire shade. This product is ideal for moms and dads who love to spend time outdoors and would like to provide their child with a safe and shady sleep option. The SnoozeShade comes with a convenient carrying case and is small enough to fit easily into your diaper bag or stroller compartments. The shade gives me peace of mind since I am constantly worrying about over-exposing my little guy to the sun and he is too young for sunscreen. He loves being outside, so this makes it easier and safer for me to give him more time in the fresh air. For more information on the SnoozeShade original and other products such as the SnoozeShade especially designed for car seats, visit the website. You can also purchase SnoozeShade on Amazon. Connect with SnoozeShade on Facebook and Twitter.